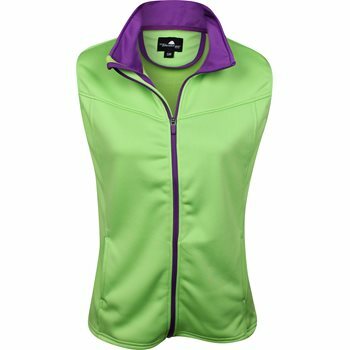 The Weather Company's Poly-Flex Vest is a breathable, wind-resistant, water-resistant, full-zip vest that features lightweight fleece backing for those cooler days on the course. It has a stand up zip through collar and two side pockets. Great color combination (blue with pink trim) and the small size fits perfectly. Good fit, comfortable and doesn't restrict the swing. Also purchased as a gift.